Ajgar Ali and Muhammad Mustafa have emerged as the winners of the JK Tyre Bangla Biswas Himalayan Drive after the fifth and final leg of the TSD (Time, Speed and Distance) rally. 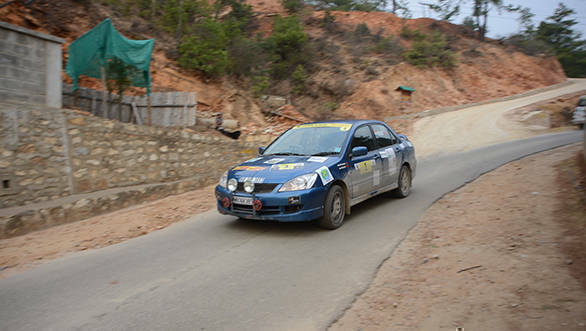 As Leg 4 of the Bangla Biswas Himalayan Drive drew to a close, the event had become the first Indian TSD rally to cross international borders twice. The rally, which on its first day started from Siliguri, made its way to Bhutan and on Wednesday reached Pashupatinagar in Nepal after returning to India in between. In the fifth and final leg, the rallyists started their journey from Hile in Nepal early on Thursday morning and made their way to Siliguri for the prize distribution ceremony. National champions Ajgar Ali and Muhammad Mustafa remained in tremendous form during the demanding five legs of the championship. They had taken the lead early on the first day and held on to it through the tough hilly terrain, dirt tracks, river beds and other challenges thrown at them through the 1200-plus kilometre rally. Deep Dutta and Prakash Muthuswamy took second place while Ashish Budhia and Arindam Ghosh took the third spot on the podium.